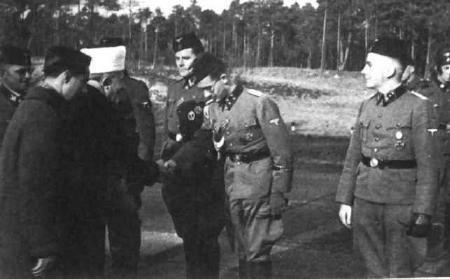 Al-Husseini together with his aid and henchman A. Shukairy aided Eichmann on his extermination program. In order to agitate for violence, he evoked a “link” of (Jews’ hitsoric) Jerusalem to Muslims, after a long history of sinking into oblivion, and abandoned by the Muslim population. Incited to bloody violence since at least 1920. The following year, in May 1921, another series of anti-Jewish riots in Jafa, Hadera, Rehovot, Petach Tikveh and Kfar Saba resulted in the deaths of nearly 100 people. The Arab demonstrators shouted incendiary slogans such as “Palestine is our land and the Jews our dogs.” They clearly made no practical distinction between indigenous Sephardic or ultra-Orthodox Jews from the old Jerusalem community… Indeed, (long before the Arabs’ deep loss of the 1967 Six-Day war, where they mark the beginning of a so-called “Occupation,”) from 1920 to 1966, Arab terrorists murdered 1513 Jewish residents of British Mandatory Palestine.Al-Husseini had used his authority as Grand Mufti and as head of the council in the 1920s and 1930s to issue fatwas agaisnt the British and the Jews… as well as against moderate fellow Arabs. 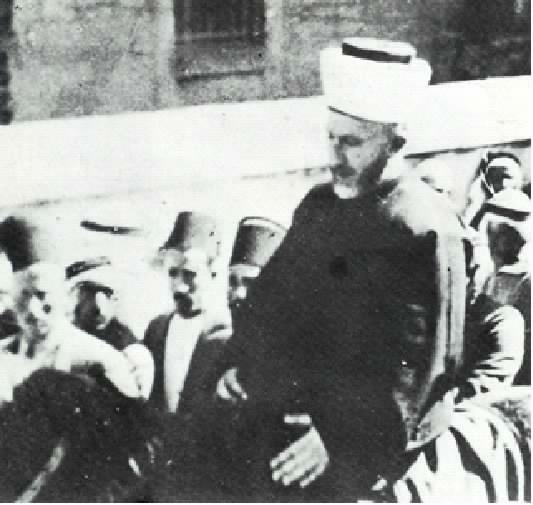 Upon becoming Grand Mufti in 1921, al-Husseini declared a fatwa of Jihad against the Palestinian Jewish settlers and simultaneously declared that all Muslims who maintained friendly relations with the Jews were to be considered as infidels, an enduring conviction in many quarters to this day. He ignited, through “provocative speeches,” the massacre in Hebron 1929, which put an end to the ancient Jewish community in Hebron, massacring dozens; people were set on fire with kerosene, tortured to death, castrated, and raped. On August 24, after Arabs had killed Jews in the Old City, 65 Jews were killed in Hebron. In all, between August 23 and August 26, 133 Jews were killed, 399 wounded and 6 Jewish colonies destroyed. He called: “Kill the Jews wherever you find them, this pleases Allah.” It raised the issue: how Arabs were incited to violence during Friday afternoon worship in their mosques… the concept of jihad and the 72 virgins a Muslim allegedly receives if he dies as a martyr. 1931 – with Muft’s collaboration, his cousin Abd al-Qadir founds the ‘Holy War Organization’ / Sacred Holy War [“munazzamat al-jihad al-muqaddas”]. It operates against the Jews and the British. Dec. 1931, Mufti organizes pan-Islamic conference. Representatives were a mixture of fascists and Islamists. He forges an alliance with Muslim Bosnian official which will help them both, later on, in WW2, to commit crimes for the Nazis. 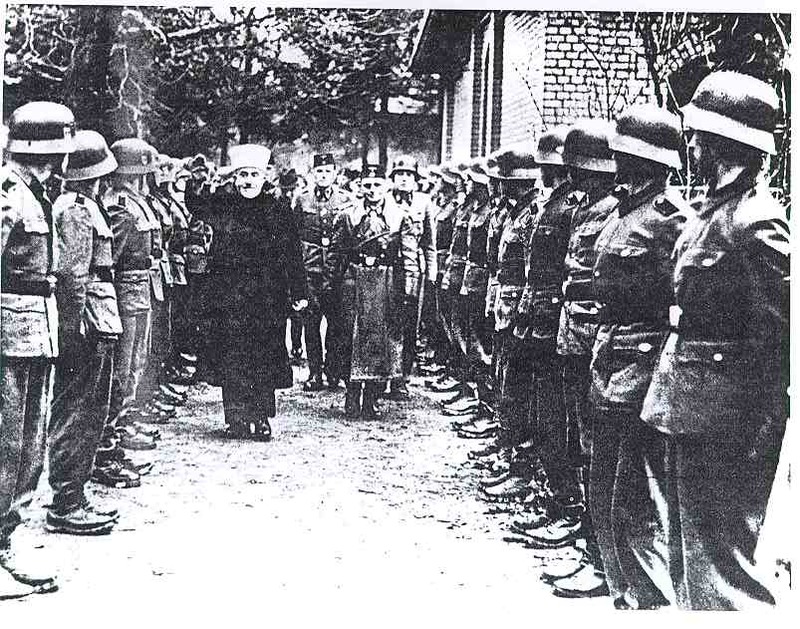 In 1935, the Mufti met al-Banna’s brother Abd-al-Rahman on behalf of al-Banna in Jerusalem; subsequent to that meeting, the Mufti arranged for the Brotherhood to receive funding from the Nazis. The Muslim Brotherhood’s al-Banna collaborated with the Nazis which he was jailed for. The Brotherhood had the ‘Mein Kampf’ translated into Arabic. Al-Banna established a youth movement whose military and physical attributes resembled those of the Nazi youth organisations, demanding absolute obedience to their leader, and declaring their willingness to use force in pursuit of the Brotherhood’s goals. His Special Apparatus was composed of members who were ‘prepared spiritually and physically to engage in jihad for the mission’. Between 1936-1939, he was -again- behind bloody riots in Palestine, made possible with funds he received from the Nazis as an ally. While there were many moderates in the 1920s, who welcomed the Jewish newcomers returning to their ancient land and joining the local Jewish population, al-Husseini, however, through his violent bloody system of intimidation and assassinations, made “sure,” there are no moderate Arabs left by the end of the 1930s. He personally ordered assassinations especialy between 1938-1941. In 1939, co-planned with the Nazis to convert 25,000 Germans into Islam, to be organized into a Moslem association – “Jamait-e-Muslimin.” They’d be sent out for propaganda. Was behind the pro-Hitler Coup d’etat of pan-Arabist Raschid Ali; called (May, 1941) for a “holy war” against the British and in favor of the Nazis. So did much of the wider Muslim clergy in that country. Incited the Farhud pogrom June 1941 in Iraq, Where 179 Jewish men, women, and children were killed; 242 children orphaned; 586 businesses looted… A Nazi-style pogrom in Baghdad that set the stage for the devastation and expulsion of the Iraqi Jews and ultimately almost a million Jews across the Arab world. On Nov. 1941 he met A. Hitler. 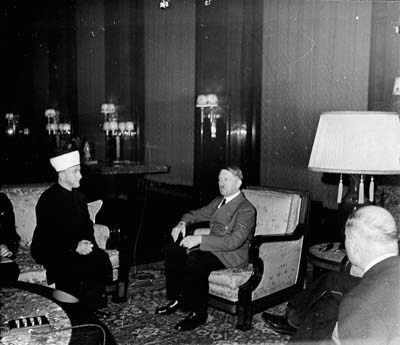 In accordance with the Nazi “racial supremacy,” Arabs were considered just as inferior as Jews, Hitler regarded them as half-apes, “and declined to shake the Mufti’s hand and refused to drink coffee with him.” They, nevertheless, found ‘common goal’ in their mutual anti-Jewish hatred. 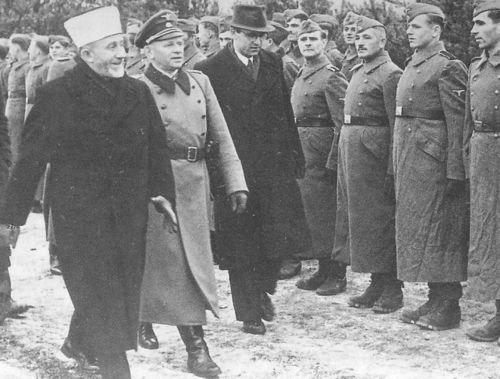 1942: The planned extermination of the Jews living in Palestine… In 1941-42 Nazi Germany appeared to be invincible in North Africa… The Mufti had several meetings with Adolf Hitler. Nazi Germany also pledged to wipe out the Jews who had been living in Palestine since time immemorial as well as the new arrivals from the beginning of the modern Zionist movement in the nineteenth century and following the Balfour Declaration in 1917… A special unit was assembled and trained in Greece in the spring of 1942 by SD officer Walter Rauff, the originator of the gassing van experiments in Poland and the Soviet Union. They were to operate behind the lines with the help of those in the region who were eager to join the task force. After El Alamein, the Einsatzkommando shifted its operations to Tunisia, where it implemented cruel anti-Jewish policies for many months. Over 2,500 Tunisian Jews were to die in the camps set up by the Nazis and their collaborators. Led -“spiritually”- in 1943-44 Muslim-Nazi divisions, recruited a substantial numbers of Moslem Holy Warriors, to commit “atrocities against Yugoslav Jews, Serbs and Gypsies.” Included was a special unit of Muslims in Albania noted for its savagery. Visiting these troops, he was frequently praying with them, exhorting them to fight for Allah. The “Grand Mufti has already repeatedly proposed bomb attacks on Tel Aviv and Jerusalem in order to injure Palestinian Jewry and for propaganda purposes in the Arab world,” particularly “around November 2, 1943.” It was rejected by the Germans. At the same time (Nov.’42), he delivered a speech stressing the common goals Nazis and Islamits have againts the Jews and praising the “solution” the Nazis found… Incitement becomes increasingly more towards ‘extermination.’ such as on the radio station ‘Voice of Free Arabism’ (VFA). The hatred that drew on religious passion merged with Nazism’s modern racist rhetoric. Not just murder but calls for genocide were literally on the airwaves. The Mufti sought -through the Nazis- the establishment of a pan-Arab federation or state, and was looked upon as the leader of the pan-Arab community in exile. A possible “Islamic Vatican” headed by the Mufti was reported on June 1946. In 1946, his (above mentioned) henchman (during his Nazi stay in Berlin), Ahmad Shukairy, justified Hitler’s slaughter of 6,000,000 Jews.At the same time, Shukairy with (the Mufti’s relative) Jamal Husseini who founded in 1935 the Arab version of the Hitlerjugend in Nazi Arab-Palestine, have accepted the Mufti, as the ‘head of the Palestine Delegation,’ before the Arab League – Bludan Resolutions.Shukairy would later be known for becoming PLO’s first chairman; for coining the genocidal slogan ‘throw the Jews into the sea.’ He’d invent a dreadful analogy to South Africa in a hate speech at the UN on October 17, 1961 (apartheid slur, after a strongly anti-Western speech), and would shamelessly/openly identify himself with Nazi groups, in December 1962. Still, in the 1950s, he was termed, the uncrowned dictator of Greater Arabia. Oversaw, in the 1960s, A. Shukairy’s ‘Palestine Delegation’ anti-Jewish hate propaganda, spreading its venom in the West. ^ Moshe Pearlman: “Mufti of Jerusalem; the story of Haj Amin el Husseini,” (V Gollancz, 1947, 91 pp.) p. 51. http://books.google.com/books?&id=GNptAAAAMAAJ&q=%22pleases%22. ^ “Atlanta University review of race and culture,” vol. 9, Atlanta University, JSTOR (Organization), 1948, p. 319. The massacre of 11 Israeli athletes by Arab Muslim ‘Palestinians’ of Arafat’s PLO / ‘Black September’ – aided by Neo-Nazis. Mastermind Abu Daoud was driven round Germany by neo-Nazi. It was executed by (one of the main architects) Ali Hassan Salameh, was the son of Shaykh Hassan Salameh [Salama], a top aide of the infamous Grand Mufti, Nazi-trainedwho worked with the Mufti to poison the wells of Tel-Aviv (operation Atlas – 1944, that could have killed 250,000 people), and later on, together with Abd el Kader led the “Holy war army,” one of the most effective and cruel commandos during the Palestine War of 1947-48. One of the architects was Abu Jihad [Khalil al-Wazir]. This aide of Y. Arafat was also behind many atrocities, such as: Abu Jihad masterminded the March 11, 1978 Israeli Coastal Road Massacre – the hijacking two civilian buses, and murder of 38 civilians, including 13 children. He also orchestrated the March 1975 Tel Aviv Hotel Savoy Massacre, murdering seven civilians. While it shocked the world, Arab newspapers were defending the killers. Later, 80,000 gathered, honored the memory of the slain Israelis. From the fears, expressed at the aftermath: Egypt’s union with Libya, whose Head of State, Colonel Gaddafi, is set on jihad, on “holy war” with Israel, raises a threat along with the hopes… with the pan-Arab urgings of Colonel Gaddafi and the inhuman terror of the guerillas… Qaddafi created a “Jihad Fund” to help finance Palestinian guerrillas and had the Palestinian militants who had been killed at the 1972 Munich Olympics buried as heroes in Tripoli. ^ “Files Show, Neo-Nazis Helped Palestinian Terrorists in Munich 1972 Massacre,” Spiegel Online, June 18, 2012. 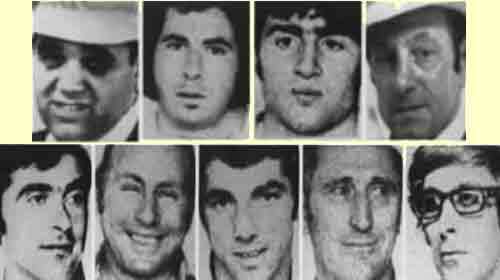 ^ Julian Gavaghan: “German neo-Nazis helped Palestinian terrorists kill 11 Israeli athletes in 1972 Munich Massacre, intelligence files reveal,” Daily Mail, June 18, 2012. ^ Ehud Yonay: “No margin for error: the making of the Israeli Air Force,” (Pantheon Books, April 13, 1993, 426 pp), p. 11. ^ Michael Bar-Zohar, Eitan Haber: “Massacre in Munich: The Manhunt for the Killers Behind the 1972 Olympics Massacre,” Globe Pequot, December 1, 2005, 256 pp. ), p. 237. ^ Joseph Cummins: “The War Chronicles: From Flintlocks to Machine Guns: A Global Reference of All the Major Modern Conflicts,” (Fair Winds, July 1, 2009 – 400 pp.) p. 352. ^ Benyamin Korn: “Arab Chemical Warfare Against Jews–in 1944,” Wyman Institute, March 2003. ^ Efraim Karsh, Rory Miller: “Israel at Sixty: Rethinking the Birth of the Jewish State,” (Routledge, January 29, 2009 – 266 pp.) p. 105. ^ Joseph Cummins: “The War Chronicles: From Flintlocks to Machine Guns: A Global Reference of All the Major Modern Conflicts,” (Fair Winds, July 1, 2009, 400 pp. ), p. 352. ^ Chaim Herzog, Shlomo Gazit: “The Arab-Israeli Wars: War and Peace in the Middle East from the 1948 War of Independence to the Present,” (Random House Digital, Inc., July 12, 2005, 476 pp.) p. 22. ^ Joseph Carmi, Arie Carmi: “The war of Western Europe against Israel,” (Devora Publishing, 2003 – 160 pp.) p. 56. ^ Harriet Sherwood: “A massacre to be remembered, The Age, July 27 2012. ^ “Israel Links Guerrilla To Munich, Tel Aviv Raids,” AP, Star-News, March 16, 1978. ^ Yoram Ettinger: “A man of peace? Ignoring Abbas’ horrific track record of the last 50 year rewards terror,” YNet, April 27, 2010. ^ Gus Martin: “The SAGE Encyclopedia of Terrorism, Second Edition,” (2011, 720 pp.) p. 410. 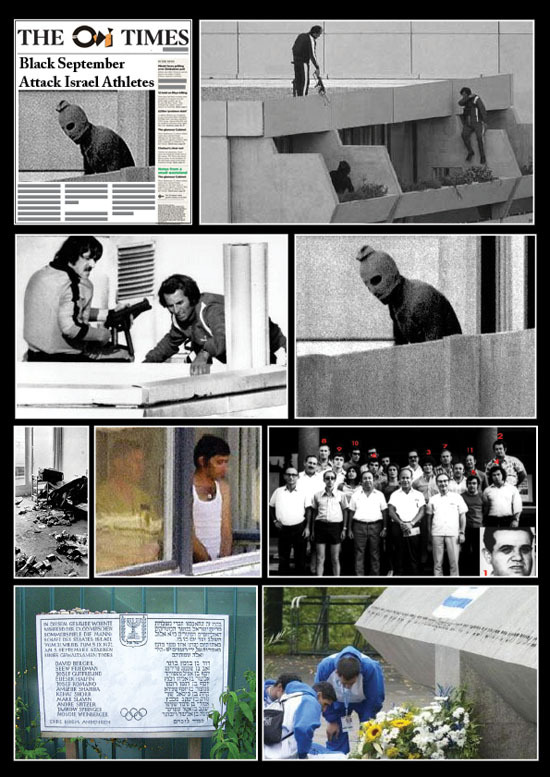 ^ By Patrick Goodenough: “Munich Olympics Massacre Said to Be PLO Operation,” CNS, May 5, 1999. 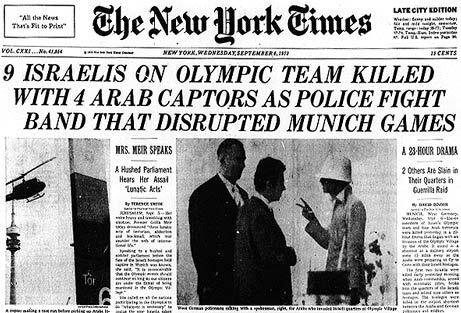 ^ Julie Stahl: “Israelis Remember Munich Olympic Massacre, Celebrate New Gold Win,” July 7, 2008. ^ “Slaughter Of 11 Israeli Athletes Shocks World,” Southeast Missourian, September 6, 1972. ^ “Arab Newspapers Defend Palestinian Guerillas,” Tri City Herald, September, 1972. ^ Frank Corkin Journal Sports Columnist: “Right Choice In Munich,” Meriden Journal, September 12, 1972. ^ “As the Flames dies, What?” The Age, September 12, 1972. ^ Barry Shaw: “Israel Reclaiming the Narrative,” (AuthorHouse, December 30, 2011, 320 pp.) p. 154. ^ Dr. Aharon Lerner: “Mastermind of Munich Massacre to Receive the Palestine Prize, Gamla, November 15, 1999. ^ Tzvi Ben Gedalyahu: “Abbas Eulogizes Munich Massacre Mastermind,” Israel National News, July 4, 2010. ^ “Ramallah Street Named After Abu Jihad; Calls For Commemorating,” Memri, April 21, 2010. ^ Zoe Fox: “PA tourney named after Abu Jihad,” JPost, May 3, 2010. ^ “Research center named after the terrorist Abu Jihad,” PalWatch, April 18, 2010. Casualties: 2,700,000 Chritians – (1915-1923) by Ottoman-Empire Muslim Turkey. 750,000 Assyrians, 500,000 Greeks and 1.5 million Armenians. Nature: 1.) Ethnic cleansing. 2.) Islamic Jihad. There were numerous calls for anti-Israel jihad. Casualties: Between 3,000 and over 10,000 Hindus were massacred in 1921, Kerala, India. [Moplah riots]. Casualties: 3,500,000 – Sudan – from 1953 to 2005. Including 2,500,000 between 1983-2005. Nature: Arab Islamic “supremacy” over “inferior” Southerners. Jihad declared in 1983 by Numeiri, and 1991 by al-Bashir. Casualties: 100,000 in Kurdistan-Iraq war [1961-1970], by the Iraqi government. Casualties: over 100,000, or upto 400,000, in Papua New Guinea, since 1963, by Muslim Indonesian: government and Jihadists. Nature: Apartheid / ethnic cleansing and jihad. Casualties: between 500,000 and 1,000,000. (between 1965-66). in Indonesia. Muslims Vs. communists rift. Islamic parties helping Suharto, Islamic leaders were calling for a jihad against the PKI, as well as the official press, and Suharto’s military gave a green light for Muslims to massacre in a jihad. Casualties: 3,000,000 – Nigeria, by Muslim [Hausa / Fulani] dominated forces against the Ibo / Christians [1966-1970]. Casualties: 2,000-25,000 between Jordanians and “Palestinians” 1970-71 (Black September). Casualties: around 16,000 in terror attacks in India since 1970. 15,674 before the 2008 Mumbai attacks of 11/26. Casualties: 300,000 – Lebanon 1970s-1999 by Syria and ‘Palestinians’. Casualties: 3,000,000 – Bangladesh, 1971 by Pakistan, with help from local Islamists. Nature: Islamic Pakistanis’ racism, contempt for “impure” Bengalis. Casualties: 300,000 – Uganda 1971-1979 under Idi Amin. Or 500,000. Casualties: 200,000 – East timor (Between 1975 and mid-1999) by (Islamic) Indonesia. 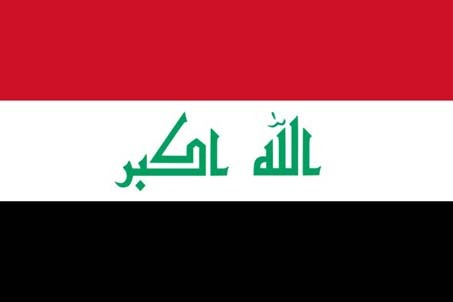 Casualties: over 300,000 – Iraq (1979-2003) under (Quran-ic) Saddam Hussein. Or as many as 500,000. Casualties: between 500,000 and 1,500,000 – Iran-Iraq war (1980-1988). Casualties: 40,000 – Syria (1982, Hama by H. al-Assad). Casualties: between 100,000-150,000 – Yemen (1984-86 N. Yemen civil war). Nature: 1.) Pan-Arabism, Nasser’s Arab nationalism. 2.) Egyptian, Soviet backed [Muhammad’s-family decsendats] Royalists vs Saudi Arabian, Jordanian, Iranian backed fighters. 3.) Sunni-Shiite divide. Casualties: 40,000 Kurds by Muslim Turkey 1984-1999. Nature: Oppression and ethnic racism. Casualties: 10,000 – [Islamic Republic of] Iran (1988, massacre of political prisnoers). Or 14,000. Or 30,000. Casualties: between 350,000 to 1,000,000. Somalia civil war since 1991. Factors: 1.) Warlords/clans, with Islamists playing a major part. 3.) Ruthless Sunni warlord Mohamed Farrah Aidid (Aideed) – wanted Somalia governed by “Islamic princpiles.” He was becoming increasingly ‘Islamist’ in nature. especially since Islamic Mujahiddin were fighting for him. 4.) One of the highlighted infamous incidents, was the al-Qaeda backed Islamists’ attack on humanitarian US mission, killing 18, in Oct, 1993. 5.) Sudan’s Hassan al-Turabi played a major role in Somali warlords feud, his Jihadists. Casualties: over 100,000 – Algeria (between 1992 and 2002). Or even 200,000. Casualties: 35,000 in Islamic terror attacks in Pakistan, since the 1990s. (Estimate as of June, 2011). Casualties: over 160,000, or at leaset over 151,000. in Iraq, since 2003. 1) Intra-Islamic bigotry: Sunni-Shiite divide. 4) Iran and its Hezbollah thugs. Note: The bloodshed continues after US withdrawal. Casualties: 30,000 children in Somalia – 2011 famine, Islamists’ fault, who have been refusing, banning aid, even preventing Somalis fleeing famine-ridden areas. Of course, there’s also a very long list of many thousands of Islamic motivated attacks, affecting: The US, Argentina, UK, France, Spain, Australia, India, Israel, Russia, Germany, Belgium, Denmark, Sweden, the Netherlands, Chechnya, the Philippines, Indonesia, Thailand, Algeria, Pakistan, (example: 6,681 were killed in 2,782 terror attacks in 2011 alone), Iraq, Iran, Egypt, Syria, Lebanon, Jordan, United Arab Emirates, Qatar, Bangladesh, Saudi Arabia, Turkey, Morocco, Yemen, Uzbekistan, Gaza, Tunisia, Mauritania, Kenya, Eritrea, Somalia, Nigeria, Sudan, Ethiopia, Mali, Tanzania, Chad, Tajikistan, China, Nepal, the Maldives, Kazakhstan, Azerbaijan, Macedonia, etc. Especially, the bloody last decade of [over] 19,000 Islamic terror attacks (between 2001-2012). Some estimated at least 40,000 deaths by Islamists between Sep. 11, 2001-2010, alone. ^ “40 Years Study Guide – General – Film – 40 Years of Silence.” Elemental Productions, Synopsis. http://www.40yearsofsilence.com/page/synopsis. DER – Documentary Educational Resources. Quality Ethnographic, Documentary, and Non-fiction Films from Around the World. http://www.der.org/resources/study-guides/forty-years-general.pdf. Twisted CNN calls Muslim Brotherhood’s Abol Fotoh: an “Islamist moderate,” and his radicalism – “hawkish”.. Paul Cruickshank also glorifies Turkey’s Erdogan as some kind of a “model,” in the M.E. Oh well. Call any (anti infidel) jihadist, from now on, a “hawkish.” Suits well the creeping submission to Islamization trend. Huh? So, the rise in anti-Copt persecution and calls of “Itbach al Yahud” –Kill all Jews, for Islam [Nov. 2011]– in the Muslim Brotherhood’s Christian Winter (Arab Spring) is a “moderate hawkish” thing, I guess. What on earth is a “moderate islamist” anyway? Is there such a thing as a “moderate fascist”? Have you all not read what the Muslim Brotherhood aspires to, an all out oppressive Islamic Caliphate (and they are “ready to go…”), a world ruled by radical Islam UBER ALLES? Because he is of he Islamic party AKP, that pushes for more Islamization in “moderate’ Turkey, where anti-Christian sentiments rise? Appeaser of the Muslim Brotherhood, Professor of Contemporary Islamic Studies at Oxford University, Tariq Ramadan sees no anti-semitism in Mohammed Merah. Let’s make it clear, not categorizing the targeting of Jews by Arab-Muslims, whether in Israel/palestine or worldwide as ‘racism,’ and ‘bigotry’ which is what it is, is in and of itself a form of intolerance towards the victims of ethnic Arab racism and religious Islamic bigotry. The same hateful mentality that denies Israelis’ the victimhood but converts the Arabs, who initiated the conflict/violence since the 1920s’ as “ultimate” victims, despite its routine conversion of its own civilians into use of war, causing their fatalities. Besides the fact that he was a member of ‘Forsane Alizza,’ banned in France for inciting racial hatred. In other words, Islamic bigots can’t even grant its victims, the clarity of its racist motivation. Tags anti semitism, appeasement, Arab anti-semitism, Arab racism, Arabs, bigotry, ethno-religious cleansing, Eurabia, France, genocide, Islam, Islamic anti-Semitism, Islamic bigotry, Islamic racism, Islamofascism, Jews, Jihad, Mohamed Merah, Mohammed Merah, Muslim Brotherhood, Muslims, Qaradawi, racism, religion, Tariq Ramadan, terrorism, Toulouse massacre. Jew Beaten to Death with Hammer in Morocco Arutz Sheva 26/3/12 Chana Yaar March 26, 2012 An elderly Jewish man was murdered by an unknown attacker with a hammer Monday in the city of Fez. The 74-year-old victim, whose name has not yet been released, worked in property management for rentals owned by other Jews. According to reports in Moroccan media, the elderly victim was seen being hit repeatedly by a man wielding a hammer. […] Critically injured, he died as he was being rushed to King Hassan II University Hospital. Earlier Monday, thousands of demonstrators stormed the parliament building in the capital city of Rabat. The protesters torched Israeli flags and expressed anger at the presence of Israeli envoy David Saranga, who was in the city to attend a meeting of the Euro-Mediterreanean Partnership (EUROMED), in advance of the Global March to Jerusalem set for this Friday, an event scheduled for the Arabs’ annual “Land Day” protest. Moroccan media outlets reported that a Jewish citizen was murdered in the northern city of Fez on Monday. According to reports, the murderer struck the victim, identified as Benjamin, in the head with a hammer. Update: the victim has been identified as Benjamin Serrero. His killer – Debka claims he was shouting Allah Hu akbar – escaped and is being hunted by police. An autopsy and investigation have been ordered by the Fez authorities. The latest PALLYWOOD ugly propaganda by “Palestinian” Arab “activist” Khulood Badawi of posting a bloodied fake image, casting an accidental death of a child as “Israel’s deed,” is another stain on the UN as a supposed “honest” broker in the conflict.. Highest time to expose the fakesness of “Palestinian” false victimhood. Nevermind that Churchil testified in the 1930s that Arab immigration surpassed Jewish immigration in Palestine/Israel. Nevermind that most Arab casualties are a result of Arab-Islamic (Palestinian or Hezbollah) use of civilian population, whereas most Israeli/Jewish victims are of intentionally targted crimes by Arabs, including by Abbas / “moderate” official PA’s Fatah-Al-Aqsa Martyrs Brigade. These inflammatory images are directly linked to inspire the targeting of little Jewish kids whether the Fogel family in their beds, Sderot schoolchildren, or chasing after little kids in Toulouse, all by Arab-Islamic bigots, in the name of Islam. 2,000-25,000 between Jordanians and “Palestinians” 1970 (‘Black September’). 3,000,000 – Bangladesh, 1971 (by Yahya Khan). 300,000 – Uganda (1971-1979 under Idi Amin). 20,000 – Syria (1982, Hama by H. al-Assad). 10,000 – Iran (1988, massacre of political prisnoers). Over 100,000 – Algeria (between 1992 and 2002). Over 300,000 – Iraq (1979-2003) under Saddam Hussein. 300,000 – Lebanon 1970s-2000 by Syria and ‘Palestinians’. 7,000 – Syria (2011-2012 by Syrian forces with Iranian and Hezbollah active participation). Most Israeli casualties are innocent non-combatants. Most Arab “Palestinian” casualties are combatants and/or involved in violent attacks. Not to mention Arab-Islamic intentional routine in causing deaths on their side via human shields. Same goes to Hezbollah tactics. In fact: IDF’s unparalleled record of sparing civilians in counter-terrorism operations. Of course, that’s besides the last bloody decade of over 18,000 Islamic terror attacks since 9/11/2001. Note: Baathist racist Arab tyrants like Saddam Hussein, used Islam and ‘anti-infidel’ ideology as well. BRUSSELS (EJP)—Like every Friday, as part of the day school activities, 13-year-old Oceane Sluijzer goes to the sport training center in Neder-Over-Hembeek, a Brussels suburb, where she plays football. There she meets other girls from the same nearby secondary public school. Many of them are from Moroccan origin and Oceane feels sometimes difficult to be integrated and to be treated well. She was in fact excluded from the group because of her look, she is blond, and because she is not of Arab descent, she says. Two weeks ago, the shy Jewish girl came as usual at the center and found again the same situation. But this time she started a discussion. “Why don’t you respect me?,” she asked a group of four girls. “Is it because I am not Arab?”. Then, after the discussion heated up, one of the Muslim girl, the group leader, shouted at her: “Dirty Jew, shut up and return to your country,” words that she repeated. She then received two slaps in the face before being badly beaten by one of the girl for several minutes. It was only thanks to her Indian girlfriend that she could get out of the situation. “If she would not have been present, my daughther would maybe have been killed,” explained her father, 44-year-old Dan Sluijzer. Suffering a head concussion and face injuries, she went to hospital. She talked on the phone to her father who told her to go straight to the police station to fill a complaint. Since then she didn’t return to her school and was so scared that she even didn’t went out of her home. But she decided to change of school. The Jewish school was one option, but she felt Hebrew and religion were “too much” for her in the middle of the year. In an joint interview with Israel’s daily newspaper Yediot Aharonot and European Jewish Press, last Thursday, along with her father, the girl said policemen told her that the four girls would be questioned, would be told that this was not permitted and that if they do it again the complaint would go further. Police reportedly asked the girl and her father not to say that this was an anti-Semitic act. “The problem is that the other youths, who are not Muslims, are scared and don’t want to react or intervene,” Dan Sluijzer, a professional actor, said. Already before the event took place, the father went to see the school principal to make him understand that there was a problem of anti-Semitism in his school. “He told me: Mr Sluijzer, they are kids. Don’t generalize what happens.” Oceane and her 16-year-old sister Salome are the sole Jewish students of the “Athenee Les Pagodes”, a school in a quiet neighborhood of mixed social population. Oceane doesn’t feel that her attackers are the “winners” because she left. One of the girl was expelled definitively from the school and two others for three days. They were told to prepare a research work on the Holocaust and the deportation of Jews. The school principal declined any comment to Yediot Aharonot and EJP “because there is an appeal from the sanctioned girls still pending,” said Faouzia Hariche, who is in charge of public instruction in the city of Brussels. Dan Sluijzer deplored the indifference of the Belgian authorities “like it was in 1940.” . “They prefer to let people fight each other.” Only Brussels Jewish parliamentarian Viviane Teitelbaum reacted and was to first to inform about the aggression. “Unfortunately nothing happened,” deplored Dan Sluizer, whose father’s family members in Holland were deported to Auschwitz. Only two of them survived. “Jews in the world are fighting for Israel. When people attack Israel, it’s like they attack me. So when somebody attacks me I want also Israel to be next to me.”” But he thinks that the responsibility to protect the Jews lies more in hands of the local authorities. Besides the aggression against Oceane Sluijzer, Jewish groups also reported the case of a 16-year-old Jewish student at the upscale European Brussels School where boys of the same age repeatedly called her “Dirty Jew” and harassed her because they disagree with Israel’s policy towards the Palestinians. Her mother complained to the school but the reaction was rather unsatisfactory. Camille left for the Ganenou Jewish secondary school. “It is unfair, the victim must leave,” commented the mother. “Why are Jews in Belgium scared?,” titled a Belgian magazine. The French bill would impose a sentence of up to one year in prison, along with a 45,000 euro ($58,000) fine, for anyone who denies the genocide. Erdogan slammed the bill as “politics based on racism, discrimination and xenophobia,” and accused France of committing genocide in Algeria, a sentiment echoed by several people who attended the protest on January 5. French’s Alleged Armenian Genocide atrocity forces Turkey to halt …. in a Swiss newspaper that “we have killed 30000 Kurds and 1 million Armenians.